Search Results for "scared look"
Scared African american young woman dressed warm wearing a red hat, scarf and white jacket running through the snowy forest. The girl constantly looks back running away from the pursuer. Slow motion. Scared African american pretty woman dressed warm wearing a red hat, scarf and white jacket running through the snowy forest. The girl constantly looks back running away from the pursuer. Slow motion. 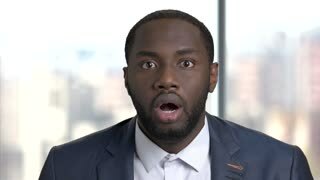 Close up face of shocked dark-skinned businessman. Afro-american entrepreneur looking shocked and scared on blurred background. Human expression of shock. Senior woman is scared. Female covering mouth with hands. Witness of a tragic event. Look and see. 1950s: Seller puts good on the counter, client puts coins in his hand. Three boys experiment in basement, small explosion happens and smoke appears, one boy gets scared, they look into can and talk. 1950s: UNITED STATES: boy stands by car. Boy looks up. Boy on sofa reads book. Boy looks scared. A scared couple is looking to the horizon fearfully over a green screen. Surprised scared bearded businessman looking closer, panicking and disappearing, studio isolated on white background. Human Eye blinking and looking around scared. Gray cat scared of something. Pets looks around. Sphere Eye Noir Macro Nervous Big. Spherical world: the big eye of a woman, looking in camera, scared. Film-noir style. Detail macro shot. Eye noir macro nervous matrix. The big eye of a woman, looking in camera, scared, with random symbols falling down (code rain, a popular sci-fi movie effect). Film-noir style. Detail macro shot. Eye noir macro nervous big. The big eye of a woman, looking in camera, scared. Film-noir style. Detail macro shot. Frame Girl Eye Macro Nervous Big. 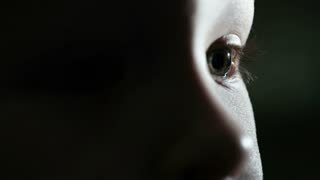 A girl holding a wooden frame with a scene: a macro shot of a big eye with make-up, looking in camera, scared. Eye macro nervous big. The big eye of a woman with make-up, looking in camera, scared. Detail macro shot.